You might currently see a pistol in-game and shake your head in disgust, but we're hear to tell you that they are underrated and let you in on the secrets to getting the most out of these guns in Fortnite! Our Fortnite Pistol Tips Guide will walk you through everything you need to know about this underused weapon type. We've got information on damage, stats, dps, all the currently in game options, and which pistols have been vaulted. There's even PNGs that you can use for some of your projects! Pistols are likely the least used weapon in the game. While this isn't completely unreasonable, they can be quite good as a third option if you already have a shotgun and assault rifle. The Hand Cannon, Dual Pistols, and Suppressed are all decent options and have different uses. 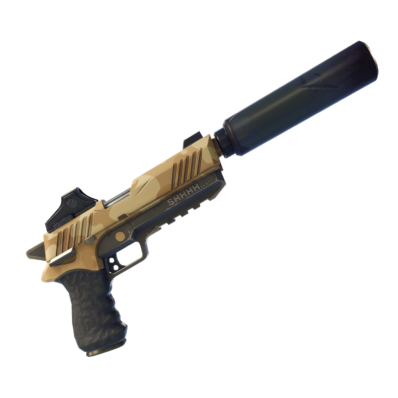 The Hand Cannon is good for breaking structures, the Dual Pistols can be a solid close ranged weapon, and the Suppressed Pistol is a decent SMG replacement. Pistols have a 2x damage multiplier and have First Shot Accuracy (if you hold ads and stand still your crosshairs will come together and that next shot will be 100% accurate as long as you don't move). The pistols fire at the same time but don't have the ability for first shot accuracy. A bit RNG-ish due to bloom, but can be quite powerful. They use medium ammo. 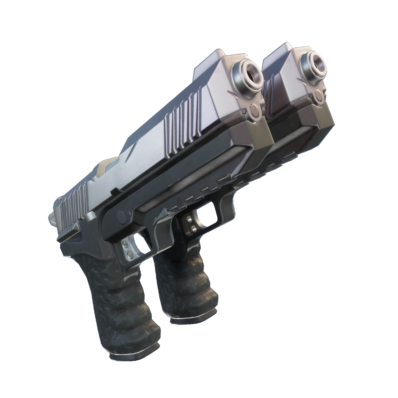 The rarities of the Dual Pistols were reduced from Epic and Legendary to Rare and Epic in the 5.4 Patch. Dual Pistol (Rare) - 41 to the body, 82 head shot damage, 162.36 DPS. Dual Pistol (Epic) - 43 to the body, 86 head shot damage, 170.28 DPS. This thing fires literally like a cannon, because not only can it knock back your opponent, but it knocks back you as well. It does big damage, but it needs to be reloaded after every shot. 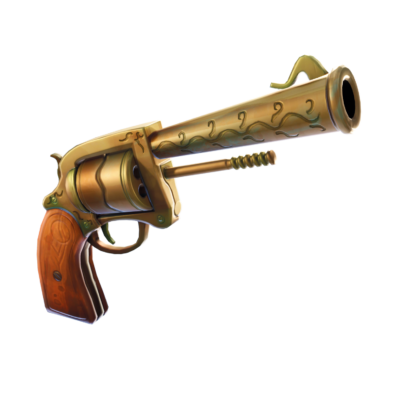 This kind of fits as the lower rarity version of the Hand Cannon. Flint-Knock Pistol (Common): 86 to the body, 172 head shot damage. Flint-Knock Pistol (Uncommon): 90 to the body, 180 head shot damage. The Hand Cannon has gone back and forth with being a good weapon. It was really good at first, and then it was nerfed and didn't see much play. It got upgraded again and could do a lot of damage to environmental objects. It became a popular option as a third option that could break structures easily. It had its environmental damage nerfed, and now it's just a decent option that can still be good for breaking structures. Hand Cannon (Epic) - 75 to the body, 150 head shot damage, 60 DPS. Hand Cannon (Legendary) - 78 to the body, 156 head shot damage, 62.4 DPS. Largely regarded as one of the worst guns in Fortnite. You are rarely ever happy to see one of these as your first weapon. Pistol (Common) - 23 to the body, 46 head shot damage, 155.25 DPS. Pistol (Uncommon) - 24 to the body, 48 head shot damage, 162 DPS. A bit of an underrated gun in my eyes, if you have a weak loadout, this can compliment it in a pinch as a second or third option. It shoots quite quickly, and is a lot more accurate than the standard pistol. The Suppressed Pistol had its rarities reduces from Epic and Legendary to Rare and Epic in the 5.4 Patch. Suppressed Pistol (Rare) - 26 to the body, 52 head shot damage, 175.5 DPS. Suppressed Pistol (Epic) - 28 to the body, 56 head shot damage, 189 DPS. 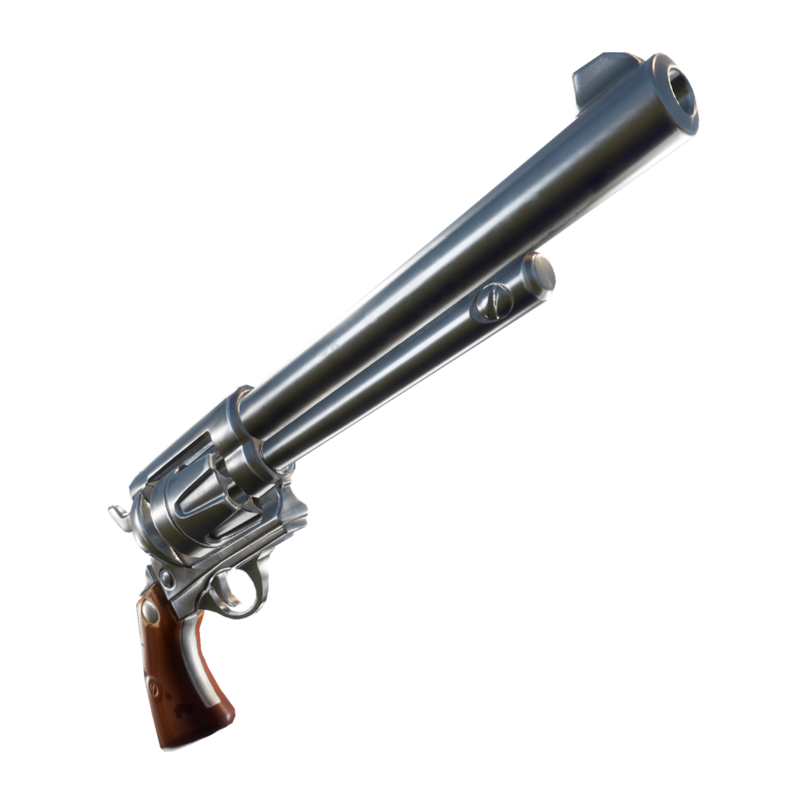 The Scoped Revolver adds a more mid to long range option for the pistol class. While it is still going to lag behind the Hand Cannon in effectiveness, it fits kind of a niche spot as a midrange option when you are lacking in the spot in your loadout. Scoped Revolver (Epic) - 42 to the body, 84 head shot damage, 67.2 DPS. Scoped Revolver (Legendary) - 44 to the body, 88 head shot damage, 70.4 DPS. The revolver is a pretty skill intensive weapon and requires extreme accuracy to be functional. However, it did get a lot better with the first shot accuracy update which allows you to hit head shots much easier if you get enough time to take the shot. The Revolver was added to the Fortnite Vault in the 5.4 Patch. Revolver (Common) - 54 to the body, 108 head shot damage. 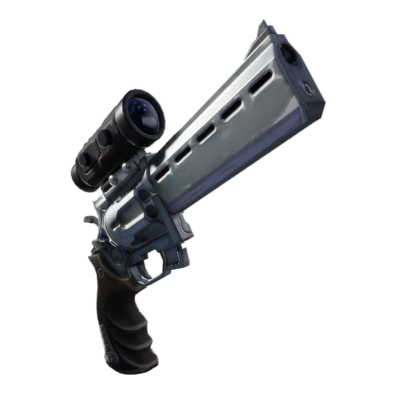 Revolver (Uncommon) - 57 to the body, 114 head shot damage. Revolver (Rare) - 60 to the body, 120 head shot damage. The Six Shooter is similar to the Revolver, but you can shoot faster from the hip while you aren't staring down the sights. If you do ADS, then you'll have accurate shots quite quickly. Six Shooter (Uncommon): 34 to the body, 68 head shot damage. Six Shooter (Rare): 36 to the body, 72 head shot damage. Six Shooter (Epic): 38 to the body, 76 head shot damage. I've grouped up the pistols where I feel like they mostly overlap. However, the suppressed pistol and the hand cannon are the far superior guns. Kind of obvious, but always aim at the head. You aren't going to finish people off quick and win against a shotgun if you aren't hitting head shots. A body shot and two head shots will finish a 100 hp enemy in the beginning of the game with a gray pistol. This will be a common scenario if you play a lot, so get used to using the pistol if you have a chance. Pistols in general fire relatively quickly, so they function as a third option pretty well. 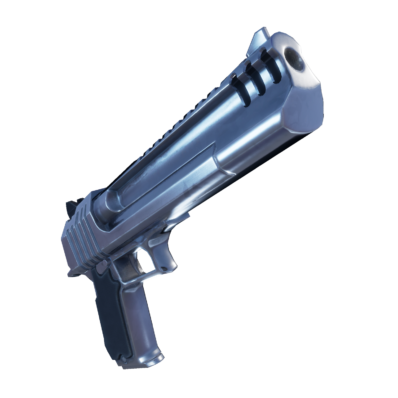 The Hand Cannon is good for blowing out walls, and the Suppressed Pistol fires quickly and does quite a bit of damage to the head. Be very deliberate with your shot because you have a pretty significant delay between shots. You might only get one shot with one of these if you are in a close range battle. Try to take advantage of the first shot accuracy as much as possible. This gun does a significant amount of damage to the head, so unless you know the person is injured that's where you should be aiming. While you won't get a fully accurate shot, try to sneak out of cover and snap off a shot if possible. You are essentially using these like a shotgun that has better range. This compliments the shotgun very well in close range fights. You can blow out a wall with the hand cannon then switch to the shotgun to take a quick shot at your enemy. Here's some of the Pistols in PNG form so you can use them for your projects. Credit to Epic Games, click to enlarge! It’s right under the dual pistols section? This helped me a lot thanks!